Kubernetes is an open-source cluster manager that makes it easy to run Docker and other containers in production environments of all types (on-premises or in the public cloud). What is now an open community project came from development and operations patterns pioneered at Google to manage complex systems at internet scale. AWS Quick Starts are a simple and convenient way to deploy popular open-source software solutions on Amazon’s infrastructure. While the current Quick Start is appropriate for development workflows and small team use, we are committed to continuing our work with the Amazon solutions architects to ensure that it captures operations and architectural best practices. It should be easy to get started now, and achieve long term operational sustainability as the Quick Start grows. Our hope is that you will be able to use the CloudFormation template and written guide to get going quickly with Kubernetes. Or, wire the Quick Start template into CloudFormation templates you already have, bringing Cloud Native Computing elements on Amazon’s infrastructure to your existing solutions. It is also worth mentioning that the AWS Quick Start represents our first upstream-friendly, supported configuration. At Heptio we are working hard to make Kubernetes more accessible to developers everywhere, and to provide quality support and services to Kubernetes users who want a clean, friendly, supported configuration of the upstream open-source project. You can expect to see us put the work into maintaining and enhancing this Quick Start. We also view it as a way to help other key members of the Kubernetes ecosystem deliver value on the Amazon platform. We believe it will “take a village” to bring the full potential of Cloud Native Computing to the enterprise, so we are passionate about helping our partners realize the full potential of their technology on a convenient Kubernetes base. Working with our friends at Tigera, we have integrated Project Calico into the AWS Quick Start so you have production-ready, secure networking right out of the box. 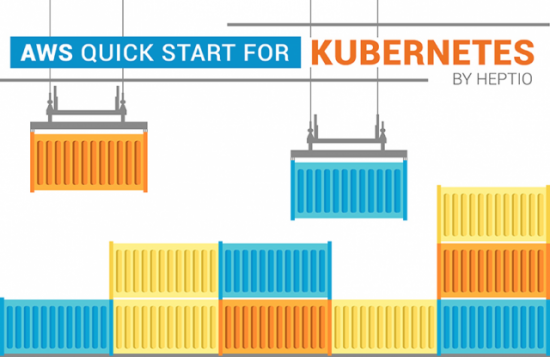 Check out their Calico for Kubernetes guide here. Our friends at Bitnami are working with us to ensure that their portable, turnkey solutions work well with this Quick Start. Bitnami provides trusted applications, ready to run everywhere. Follow the Bitnami Get Started documentation to deploy turnkey solutions such as Wordpress, Redis, MongoDB, and Odoo. Right now, this Quick Start is a great way to get a simple cluster up-and-running for experimentation. As we move to delivering a production-grade solution, a key focus will be around security. We are pleased to be working with friends at Twistlock to make sure that their technology will integrate seamlessly with this solution, and hope to speak more about that in the future. We invite you to take this Quick Start for a test drive, and extend it into your own solutions. If you encounter issues with the core stack, we will do our best to provide support. Please visit our Next Steps for Kubernetes on AWS to start exploring your new Kubernetes deployment.